Day 16 in GBRow 2013 been one of heaven and hell. Heaven for Jason McKinlay and Josh Tarr in Savoir Faire. They left anchor on the Northern Ireland coast to make the 12mile crossing to the Mull of Kintyre. 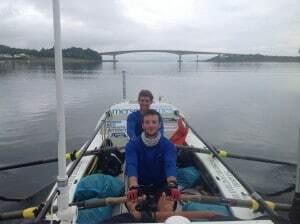 In perfect sunny weather with a light tail wind, they safely negotiated the crossing in around five hours then spent the rest of the day rowing in two-hour shifts up the west coast of Mull. Tonight they are north of Campbeltown. Jason and Josh expect to anchor at midnight for about four hours while the tide is against them before setting off again. Tomorrow Savoir Faire will reach the Island of Mull and possibly the Skye Bridge by nightfall. Just over 150 miles north, race leaders the Islanders were going through hell. The crew of the Black Oyster anchored for several hours after failing to make headway against tide and wind. This afternoon they set off again, hoping the wind would live up to the forecast and switch to the south. Tomorrow they hope to reach the treacherous tides and the forbidding sandstone cliffs of Cape Wrath, the most north-westerly point in this epic 2,000-mile race.